Users and maintainers of the Traces layer. The role of the Traces layer (part of the Ceylan project) is to provide Erlang applications with advanced trace services, so that the user can efficiently log, browse and search through detailed runtime messages that may be emitted concurrently (i.e. in a parallel, distributed way). We present here a short overview of these services, to introduce them to newcomers. The next level of information is to read the corresponding source files, which are intensely commented and generally straightforward. This layer is in charge of providing Erlang programs with the means of emitting, collecting, storing and browsing applicative traces (i.e. logs). For that, various components have been designed and implemented, such as trace aggregator, emitter, listener, supervisor, etc. They collectively constitute the Traces layer, whose prerequisites are the WOOPER layer (for object-oriented primitives) and the Myriad layer (for many lower-level services; itself a prerequisite of WOOPER). The main purpose of this Traces layer is to provide adequate traces for distributed systems (a rather critical feature in order to debug in these difficult contexts), and to ease their study and browsing. A few back-ends are available for that, from the direct reading of the (raw) trace files to considerably more user-friendly solutions, such as the generation of PDF reports or the use of our more advanced trace format, which can be read by commercial tools such as LogMX . The Ceylan-Traces layer defined a trace format of its own, supported by our Java-based parser for LogMX. There is also an addition trace severity, void, that designates traces that shall be muted in all cases. Its purpose is to provide another means of muting/unmuting some traces, instead of commenting out/uncommenting said traces. The traces corresponding to an execution are represented as an wallclock-time ordered stream of trace messages. These traces are possibly exchanged over the network or stored in a file, whose extension is conventionally .traces. For example the traces for a test named my_foobar_test are typically stored in a my_foobar_test.traces file, generated by the trace aggregator in the directory from which the corresponding test was launched. This process can be a standalone module (ex: a test or an application launcher, see traceManagement_test.erl) or, more frequently, it might correspond to a WOOPER (active) instance, in which case it shall inherit, directly or not, from class_TraceEmitter (see class_TestTraceEmitter.erl for a complete example of it). Many API variations exist (see class_TraceEmitter.hrl), to account for the various trace content, contexts, etc., but ?T(Message) and ?T_fmt(MessageFormat,MessageValues), for T corresponding to a trace severity, are by far the most frequently used. As a result, the availability of a State variable in the scope of this macro is expected. Moreover, this WOOPER state variable shall be the one of a class_TraceEmitter instance (either directly or, more probably, through inheritance). This is not a problem in the most common case, when using traces in member methods (as by design they should be offering such a State), yet in constructors the initial state (i.e. the State variable fed to the construct operator of this class) is generally not the one of a trace emitter already. As a result, an instance will not be able to send traces until the completion of its own class_TraceEmitter constructor, and then it shall rely on that resulting state (for example named TraceState). Sending a trace from that point should be done using ?send_debug(TraceState,Message). In addition to browsing the produced traces per emitter, origin, theme, wallclock or applicative timestamps, etc. it is often useful to be able to sort them per emitter categorisation, such a categorisation allowing to encompass multiple emitter instances of multiples emitter types. Categories are arbitrary, and are to be nested from the most general ones to the least (a bit like directories), knowing that subcategories are to be delimited by a dot character, like in: Art.Painting.Hopper. As a consequence, any string can account for a category, keeping in mind dots have a specific meaning. Hierarchical categorisation allows to select more easily a scope of interest for the traces to be browsed. We chose on purpose a different classname than class_Animal, to better illustrate that trace categories can be freely specified. Then all traces sent by all cats will be automatically registered with this trace emitter category. The purpose of the trace_categorize macro used in the above example is to register the trace categorisation define through the inheritance tree so that, from the start, the most precise category is used . Otherwise, should the various constructors involved declare their own categorisation (which is the general case) and send traces, creating a cat instance would result in having these traces sorted under different emitter categories (ex: the one declared by class_Cat, by class_Creature, etc.). Tracking the messages emitted by a given instance would be made more difficult than needed. The trace macros used above can be fully toggled at build-time, on a per-module basis (if disabled, they incur zero runtime overhead, and no source change is required). See the ENABLE_TRACES make variable in GNUmakevars.inc for that, and do not forget to recompile all classes and modules that shall observe this newer setting. Note that the warning, error and fatal trace severities will not be impacted by this setting, as they shall remain always available (never muted). Doing so incurs a very low runtime overhead anyway (supposing of course that sending these failure-related messages happens rather infrequently), as the cost of a mostly idle trace aggregator (which is spawned in all cases) is mostly negligible - knowing that runtime resource consumption happens only when/if emitting traces for good. In some cases, it may be convenient to have first one's lower-level, debugging traces be directly output on the console. Then, once the most basic bugs are fixed (ex: the program is not crashing anymore), the full power of this Traces layer can be best used, by switching these first, basic traces to the more advanced traces presented here. (with no further change in the trace parameters). It should be noted that the ordering of the reported traces is the one seen by the trace aggregator, based on their receiving order by this process (not for example based on any sending order of the various emitters involved - there is hardly any distributed global time available anyway). So, due to network and emitter latencies, it may happen (rather infrequently) that in a distributed setting a trace message associated to a cause ends up being listed, among the registered traces, after a trace message associated to a consequence thereof ; nevertheless each trace includes a wall-clock timestamp corresponding to its sending (hence expressed according to the local time of its trace emitter). A total, reproducible order on the distributed traces could be implemented, yet its runtime cost would be sufficiently high to have a far larger impact onto the executions that this trace system is to instrument than the current system (and such an impact would of course not be desirable). In which case the trace supervisor will first receive, transactionally, a compressed version of all past traces; then all new ones will be sent to this new listener, resulting in no trace being possibly lost. The trace supervision solution can be switched at compile time (see the TraceType defined in traces/src/traces.hrl); the Traces layer shall then be rebuilt. All processes are able to emit traces, either by using standalone trace sending primitives (mostly for plain Erlang processes), or by inheriting from the TraceEmitter class, in the (general) case of WOOPER-based processes. In the vast majority of cases, all these emitters send their traces to a single trace aggregator, in charge of collecting them and storing them on-disk (for most uses, their memory footprint would be quickly too large for RAM), according to an adequate trace format. This trace format can be parsed by various trace supervisors, the most popular being LogMX. Various measures have been taken in order to reduce the overhead induced by the overall trace system. Notably traces are sent in a "fire and forget", non-blocking manner (thanks to oneways, which are not specifically acknowledged). The number of messages exchanged is thus reduced, at the cost of a lesser synchronization of the traces (i.e. 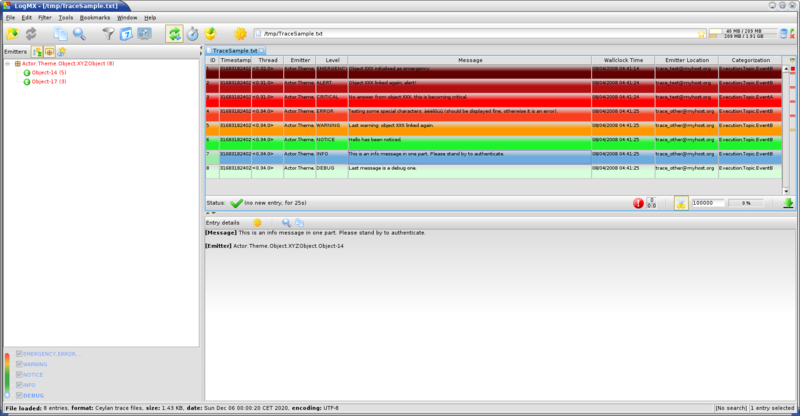 there is no strong guarantee that the traces will be ultimately recorded and displayed in the order of their emission in wallclock-time, as they will be directly and sequentially stored in their actual order of receiving by the trace aggregator , an order which itself depends on the potentially varied network latencies experienced from the potential multiple sources to the trace aggregator). For example, if both the trace aggregator and a process B are running on the same host, and if a process A, running on another host, emits a trace then sends a message to B so that B sends in turn a trace, then the trace from B might in some cases be received - and thus be listed - by the aggregator before the trace for A (it depends on the network congestion, relative scheduling of processes, etc.). When sending a trace, an emitter relies on its trace_timestamp attribute, and sends a (binarised) string representation thereof (obtained thanks to the ~p quantifier of io:format/2 ). This allows the trace subsystem to support all kinds of application-specific traces (ex: integers, floats, tuples, strings, etc.). Each trace line is a raw text (hence not a binary content) made of a series of predefined fields, separated by the pipe (|) delimiter character. The text message included in a trace can contain any number of instances of this field delimiter. whose troubleshooting mode is enabled. This allows the use of the Traces code in as wide a variety of software projects as possible, while still maintaining copyleft on this code. Being triple-licensed means that someone (the licensee) who modifies and/or distributes it can choose which of the available sets of licence terms he is operating under. We hope that enhancements will be back-contributed (ex: thanks to merge requests), so that everyone will be able to benefit from them. As mentioned, the single, direct prerequisite of Ceylan-Traces is Ceylan-WOOPER, which implies in turn Ceylan-Myriad and Erlang, version 21.0 or more recent . Note that, in the Ceylan-Myriad repository, we have a script to streamline the installation of Erlang, see install-erlang.sh; use install-erlang.sh --help for guidance. $ cd Ceylan-Myriad && make all && cd ..
$ cd Ceylan-WOOPER && make all && cd ..
$ cd tests && make traceManagement_run CMD_LINE_OPT="--batch"
Bugs, questions, remarks, patches, requests for enhancements, etc. are to be reported to the project interface (typically issues) or directly at the email address mentioned at the beginning of this document. If you have information more detailed or more recent than those presented in this document, if you noticed errors, neglects or points insufficiently discussed, drop us a line! (for that, follow the Support guidelines).